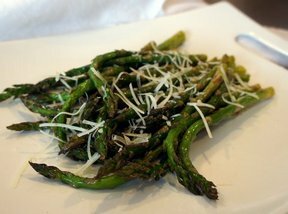 Just when you think roasted asparagus can't get any better! 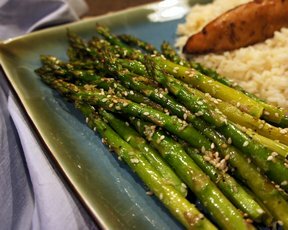 These sesame seeds add a little bit of nutty crunch to this vegetable. Seasoned perfectly with garlic, salt and pepper, this is a great side to any meat. Line a 10x15 inch baking pan with foil or parchment paper. 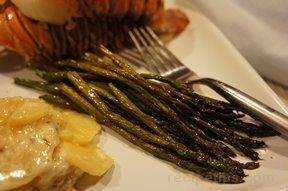 Arrange asparagus in a single layer on prepared pan. Drizzle with oil. Sprinkle with salt, pepper, sesame seeds and garlic. Toss to combine. Bake, uncovered, at 400 for 12-15 minutes or until crisp-tender, turning once. 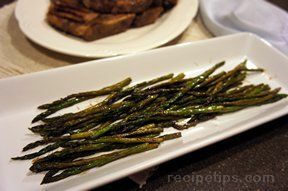 "I LOVE roasted asparagus and the little bit of sesame seeds makes them even better! Be sure not to over cook so the spears don't get too soft. 10-12 minutes is perfect."